Last week, I took my “The Bible as a Key to Environmental Thought” class to the Uvda Valley, behind Kibbutz Ketura. The Uvda Valley is home to over 150 archaeological sites, ranging from 10,000 to 6,000 years ago. We were met by Dr. Uzi Avner, an extraordinary archaeologist with a fresh and unique perspective on ancient desert life, who has been involved with the Arava Institute since its doors opened in 1996. To walk with Uzi is to learn how to read the desert like a book telling many stories. We learn from this that an echo from the ancient desert dwellers was heard by the authors of the Bible; for the standing stones that we were looking at were natural and uncut. Why did the stones for the altar need to be made from uncut stones? The Biblical understanding of God is that God is without form, without body. We can only see the results of God in the world. Or to put it another way, nature can be understood as a manifestation of God’s presence in the world. In that thinking, the uncut stones represent the direct work, the direct artistry of God. Both the desert dwellers and later Biblical writers found God’s presence not in the work of humans, but in nature left untouched by us. At another site Uzi spoke to us about the change from building in the round to building with 90 degree square angles. Nomads, he explained, tend to build in the round. some of the ancient sites we were looking at, as well yurts, igloos, and teepees from other nomadic cultures. While more settled peoples, he told us, build their buildings more at square angles. In the Uvda Valley, there are also examples of such ancient structures with square angles, representing settled communities. Why the difference? Nomads roam to the rhythms and flow of nature; the shape of nature, for the most part, is more curved. Settled communities have greater impact on nature as they often make changes to it to serve their needs. Building with square angles represents an attempt to change and control nature. The interesting thing is that we tend to feel better in buildings that have curved walls and spaces. Scientists and psychologists have much to say about this very human dynamic. When it came to build the present Arava Institute offices, in one of the old turkey coops of the kibbutz, the architect Ronit Duzi designed the inner walls of the offices and meeting room curved, applying an understanding from the local ancient desert dwellers to the building I sit in now. Many who enter the building comment on the “feel” of the building because of its curved walls. 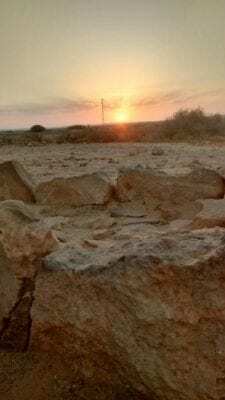 The wisdom and insights of those who lived in the desert millennia ago and how they lived with and understood nature has left its imprint in many places including the Bible and the offices of the Arava Institute for Environmental Studies.